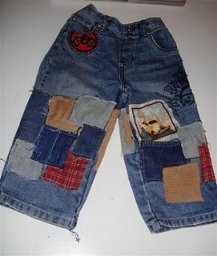 Erica Louise from Recycled Fashion found a cool way to lengthen her little boy’s jeans. Instead of adding length at the bottom, she slashed them at the middle and added patches there. Go to the tutorial. Thank you so much for including my tutorial to craftgossip!